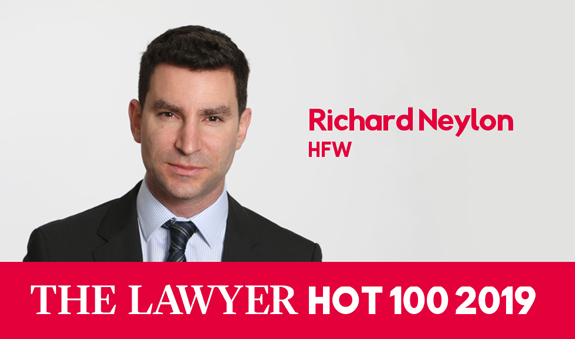 HFW partner Richard Neylon has been named in The Lawyer's 'Hot 100' 2019. The Lawyer says that the list comprises the lawyers "at the top of their game…acting on the most significant matters, disrupting the industry with their creative flair or transforming their organisations". Richard is widely regarded as the world's leading piracy and hostage lawyer, having helped free more than 1,800 hostages, and was part of a team commended by the UN Security Council in 2017 for their work combating piracy. Richard also advises international companies on terrorism, kidnapping, hijackings, extortion, drug seizures, detentions and cyber crime incidents. His broad, global practice combines complex legal issues with advice on the strategy and coordination of diplomatic, security, law enforcement, PR and investigative efforts. He is also well-known for handling major marine casualties and has assisted clients in some of the highest-profile incidents in recent years.